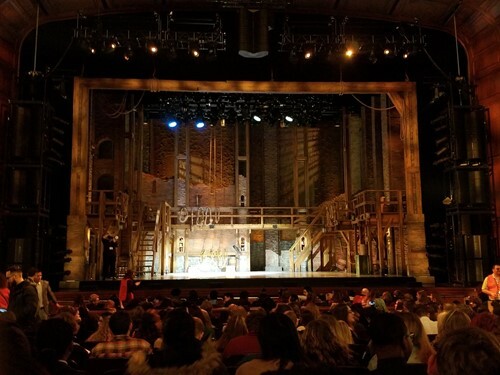 Feb. 5, 2019 -- Heights High juniors in American Government classes attended a special performance of the hit musical Hamilton, including a Q & A session with cast members, at the Benedum Center for Performing Arts in Pittsburgh on January 25. Earlier this fall, Heights High was selected to participate in the Gilder Lehrman Institute Hamilton Education Program. This private program is available only for select schools who are affiliates of the Gilder Lehrman Institute of American History, and was made possible through a partnership with Hamilton and the Rockefeller Foundation. The program also combined Founding Era classroom resources and document-based student projects. Led by social studies teacher Rick Wiggins, students engaged in a history/government research project which culminated in the creation of a unique performance piece. Student projects were submitted to the Gilder Lehrman Institute. Students from Pennsylvania were ultimately selected for presentations on stage at the Benedum Center the day of the matinee. Many students said the special projects and performances helped put American history into context for them. "I've learned a lot about the presidents and Hamilton's life and time period. I also learned that people have to be courageous when doing things they love," Arianna said. "I enjoyed the fact that I saw people who looked like me on stage performing," Damari recalled. "I also liked the music." The trip was made possible with the assistance of Principal Byron Hopkins and Gifted and Fine Arts Coordinator Toia Robinson-Snowden. Written by Lin-Manuel Miranda, Hamilton: An American Musical, is a sung and rapped play about the life of American founder Alexander Hamilton. Inspired by historian Ron Chernow’s biography Alexander Hamilton, the musical earned 11 Tony Awards, one of which was for Best Play of 2016.